The Cento1 Hybrid was designed to re-imagine the traditional limits of usability of a high-level racing bike: a product that combines the special distinctive traits of Wilier Triestina products with the cutting-edge intelligence of the lightest servo-assistance system on the market. The result is a true racing bike with pedal assistance which weighs just 11,9 kilograms - a record in the e-road category. The first intelligent racing bike created with a specific mission: to give as many people as possible the opportunity to enjoy the emotions that only a high-end racing bicycle can offer. Cento1 Hybrid was designed for you, whoever you are: Get yours! One of the most important aspects for us was to achieve a record weight: we have succeeded in creating a racing bike with pedal assistance that weighs less than 12 kg. A lightweight monocoque carbon frame, high-quality mechanical components and an Ebikemotion servo-assistance system, with a total weight (motor, battery and controls) of 3.7 KG, the lightest solution on the market. When designing the Cento1 Hybrid, we focused on those individuals who are discovering the world of racing bikes for the first time, as well as the thousands of passionate cyclists who already use racing bikes, but who struggle to keep up with their friends, or who can no longer conquer their favourite climb. The Cento1 Hybrid is composed of a monocoque carbon frame and fork, built using the same composite materials and with the same technologies that we usually employ on our high-end competition bicycles. The shape and geometry of the Cento1 Hybrid frame derives from the NDR family of racing-endurance bikes, which offer less tiring riding positions without relinquishing their racing spirit. 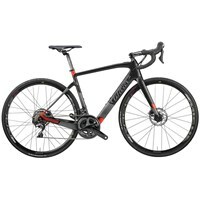 The Cento1 Hybrid is fitted with traditional-type components, such as hydraulic disc brakes, 11-speed Shimano groupset and high-profile aluminium wheels. The only component that differs from the standard equipment provided is the rear hub, which contains the drive unit that provides pedal assistance. The energy required by the motor is deliveredby the battery, which is neatly integrated into the down tube of the frame. The system is controlled (on, off and monitoring) via a button which is integrated into the top tube, enabling the rider to choose from the various assistance modes offered by the Cento1 Hybrid. The intelligent solutions installed on the Cento1 Hybrid enable the limits of the person riding the bike to be understood and overcome, assisting the cyclist at just the right moment. There are several options for using and managing the entire system. The simplest of these options is just to use the controller integrated into the top tube, which enables you to turn the system on and off and to select the desired level of assistance, by pressing the backlit button. The intelligence of the Cento1 Hybrid doesn't stop there: the system can also help when you want to monitor other parameters - your heart rate, for example. When paired with a heart rate monitor belt, the maximum heart rate can be set. If your heart rate reaches the predetermined threshold during activity, the system will engage the motor, enabling your heart rate to return to within the threshold set without having to stop pedalling.